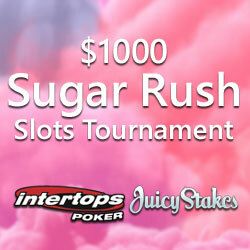 For the next two weeks the $1000 Sugar Rush Slot Tournament at Intertops Poker and Juicy Stakes Casino features two of the casinos sweetest slot games, Sugar Pop and Sugar Pop 2: Double Dipped from Betsoft. Players will automatically earn tournament points playing either of these games and the top ten point earners will win $1000 in prizes. For two weeks, Monday, August 20 to Sunday, September 2, players will earn one point for every spin of $.10 or more on any of the featured games. First prize of $300 will be awarded to the player with the most points. Prizes must be rolled over at least once on Betsoft games before withdrawal. In the original Sugar Pop game, popping candy explodes when three or more of the same color touch. New candies take their place, creating new combinations. Players advance through levels and get access to more and more powerful candies and higher pay outs.